There are lots of ways to help us do what we do. 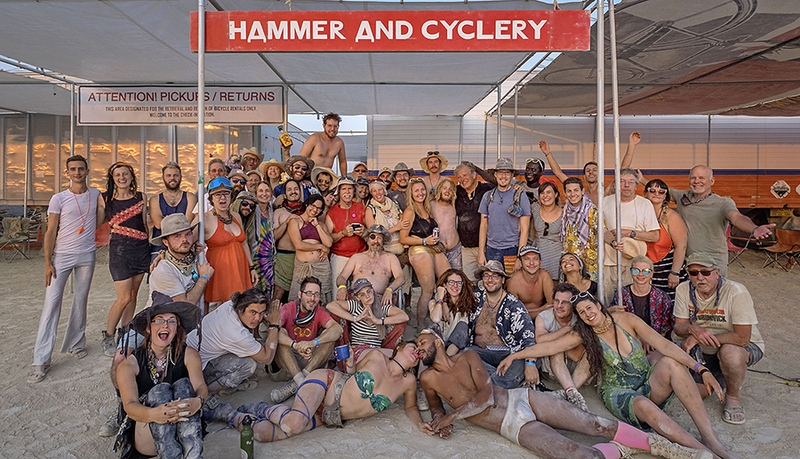 If you can't join the Hammer And Cyclery crew at Burning Man, you can rent a bike and pick it up at our camp. You can donate your bike after Burning Man at our sister camp, Stars And Bikes. You can also contribute directly to our fundraising efforts with a cash gift. Not only do we donate hundreds of spare tubes, bottom brackets, and other parts, we are a NO DUES camp. We work together all year to create Hammer And Cyclery and during Burning Man each member of our camp works a full shift every single day. Because of that effort, we can provide food, water, and bikes for all of our campmates. Finally, several of our members attend Burning Man on camp scholarships that cover their ticket and transportation. All of this takes money.